A delicious and healthy (plus super easy) toasted coconut and honey almond granola. 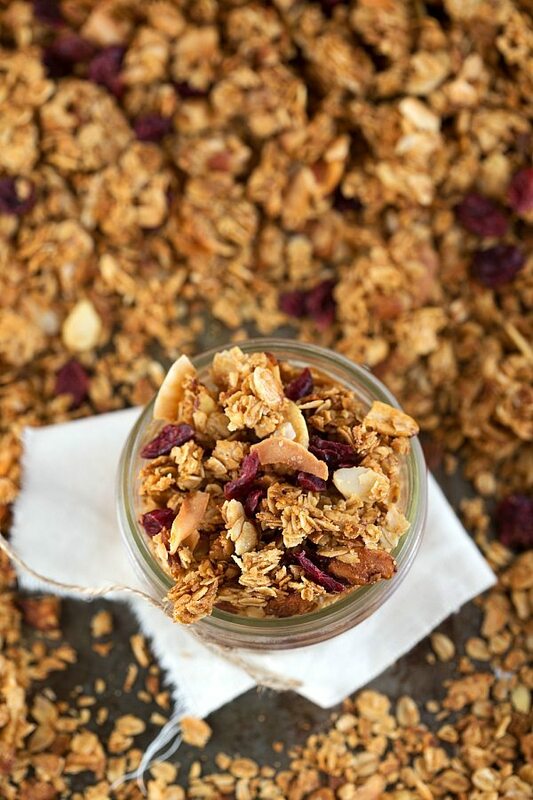 This granola is great to top off a parfait, mixed in cereal, or just eaten plain! How was your New Years? Did you have a great first day of 2015?! Mine was probably the best New Years Day I’ve ever had! Very late last night (thanks to several flight delays) we were able to welcome one of my very best friends, my sister, home from Helsinki, Finland! She has been there for the past 18 months serving a church mission. Although we’ve been able to e-mail her weekly, the missionaries are only able to call home on Mother’s Day and Christmas. Needless to say it was such a great reunion and so amazing to hear her voice and see her (and HUG) her after such a long time. I’m pretty much beside myself with excitement. It’s also pretty cool to see how much she’s changed. I mean, speaking a language like Finnish is one of the obvious things, but there’s a lot more that I don’t think I could ever articulate into words. But speaking of Finnish, what a COOL language. All of my siblings and I probably drove her crazy with “say this in Finnish,” or “how do you say this in Finnish?” or “say something else in Finnish.” It’s pretty fun to hear the language. I immediately wanted to re-create it of course. The flavor was a vanilla almond with pumpkin seeds. Vanilla almond flavored things tend to always be my favorite. Vanilla almond scented candles – you bet I have a bunch of those! Vanilla almond Special K? My favorite cereal evah. Vanilla almond granola now definitely needed to happen. As I was reading the ingredients on the back of the granola, I noticed coconut oil listed. Maybe I’m way late to the game, but I’ve never made a granola with coconut oil. I’m now convinced that is the secret ingredient to the best granola! Then because I always like a little fruit or variety (usually chocolate chips, I’ll be honest) in my granola, I added some dried cranberries and fell in love. This granola is officially the best I’ve ever had! Plus it makes a fantastic (and healthy) breakfast to kick off this New Year! Combine the oats and slivered almonds and set aside. In a medium-sized bowl, combine the honey (measure exactly - don't overfill the measuring spoons), coconut oil (measure exactly when it's melted and not in the hardened state), brown sugar (measured lightly packed), vanilla extract, and salt. Microwave mixture for 15 seconds and stir until well combined. Pour the honey mixture into the oat and almond mixture and stir until well combined. Add in the flaked coconut. Spread the granola evenly onto a parchment lined baking sheet. Bake for 20-30 minutes (depending on the heat of your oven) making sure to flip and stir the granola around every 6-8 minutes. Remove and allow the granola to harden and set up. (It may be soft and not very "granola-like", but it hardens as it dries out so be careful to not over-cook it). Mine generally takes about 22 minutes and the coconut is a light brown color. 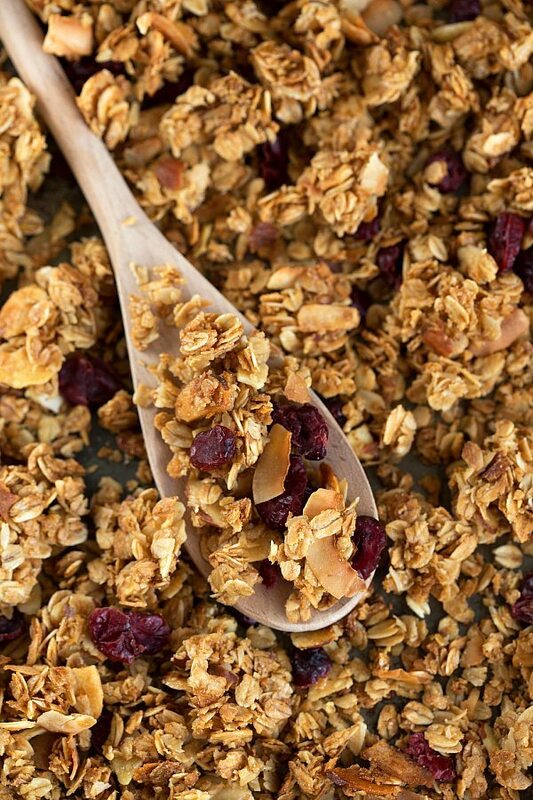 Once the granola is hardened, stir in the dried cranberries. Sounds like you had a fantastic new years eve! Yummy granola! I am in love with homemade granola, and this coconut honey almond version sounds just perfect! I discovered coconut oil in granola last summer and have never looked back! 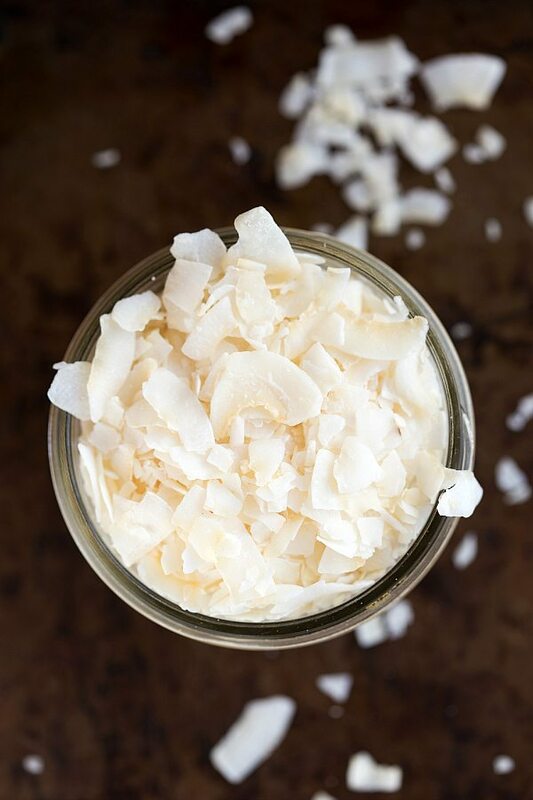 And toasted coconut is the best! Happy New Year!! This granola looks perfect, Chelsea! I absolutely love your pictures. I can almost taste it right through my screen. Pinned! That’s so awesome that you got to start your year off by seeing your best friend! I keep saying this, but… I have a feeling this is going to be a very good year 😀 And speaking of very good… this granola looks amazing. I’m seriously loving all the flavours and textures — this would be dangerous around me 😆 Pinned! sounds like you had a fabulous reunion with your sister!! I love that she is serving at a church mission in Finland. . that’s pretty awesome!! and this granola!!! love. . I could seriously eat this everyday this year! Here’s to a great 2015 for us all!! Twinning with the granola recipes today! I love vanilla/almond as a combination and the added coconut and honey- winning! I had a friend who did exchange in Finland and I swear seeing the language in writing is just as cool as hearing it out! Ohhhhh this looks amazing, Chelsea! I’ve come to the point where I simply can’t eat my yogurt without some crunch texture in it, but store brand granola can get so pricey! Love how easy this is! This granola sounds fantastic! I, like everyone else, am compiling healthy recipes for my meal planner, and I’m totally adding this. Sounds like your New Years was super exciting! Happy 2015! Having your sister come home sounds like the best way to spend your new year 🙂 And this granola looks amazing! Love the roasted coconut and almonds! I could snack on this all day long! Happy Happy New Year, Chelsea! I’ve only tried granola a few times and I’ve been dying to make it recently. This looks like such an awesome recipe. Love the raspberries with it, Yummmm! Beautiful granola, Chelsea! I hope you are having a great start to 2015! So glad you got to be reunited with you sister! What a great way to start off the year! Aww what a wonderful way to start the new year! And this granola sounds fantastic! I haven’t made a batch in far far too long … coconut honey and almond?? Yess! This granola is so beautiful! 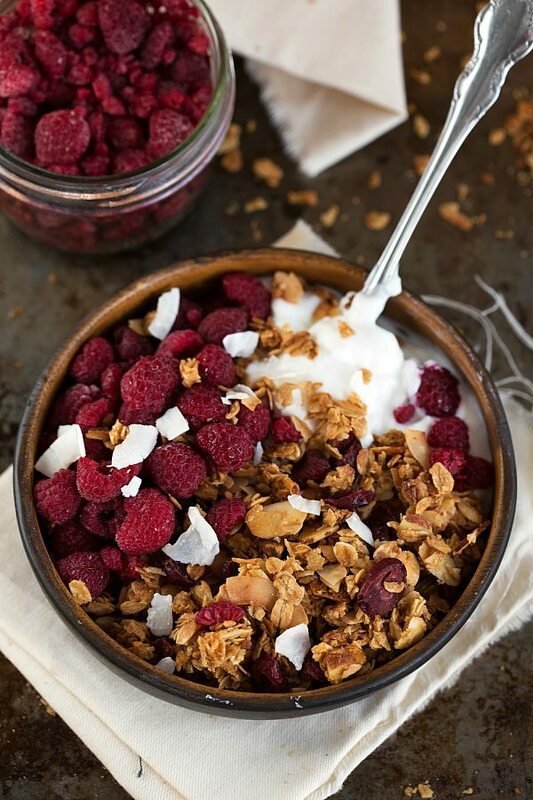 Love the shot in the bowl with the raspberries and yogurt! 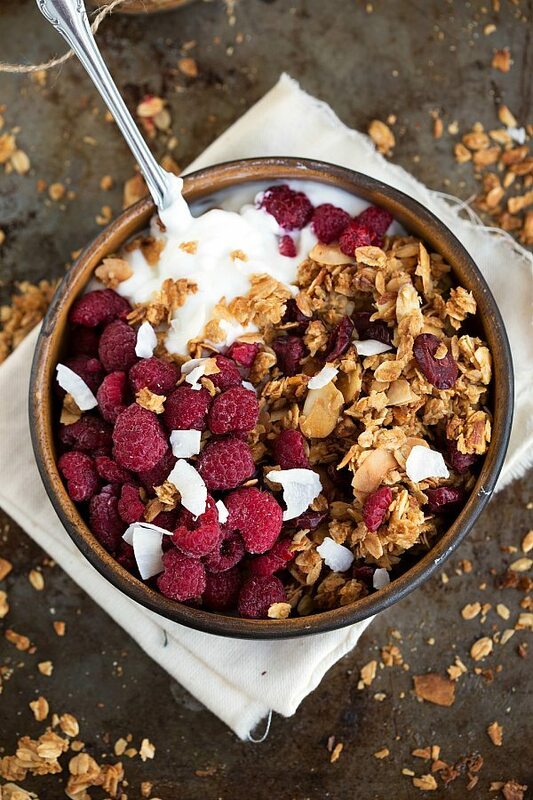 This is such a beautiful granola! Love your shots and the combination of flavours Chelsea! One of my good friends from high school went on his mission about a year after we graduated. He was in Mexico, and since he only had a few minutes of computer time per week, we actually wrote old-fashioned letters back and forth. It was really fun to receive snail mail, but it was even more exciting to see him after he returned. I can only imagine how much better it was for your and your sister! 🙂 And this granola… Just one word: YUM! Pinned! Looks delicious! 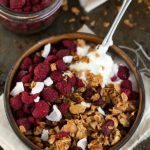 I have been looking for an easy granola recipe to eat with yogurt…thanks for posting! Hi Chelsea! I just wanted to say you’re an absolute legend. This is my all time favourite recipe for granola. I’ve made it every week since finding it. Thank you so much for sharing, it’s a winner! ❤️? Awe this made my day!! SO happy to hear it 🙂 Thanks so much for your sweet comment! This recipe has been on my list of things to make for so long! I normally buy coconut cranberry granola from Trader Joes for my hubby, so I thought he might like this instead. This was my first time making granola and the first attempt was an epic fail – burnt inedibly at 17 minutes, probably because I was too lazy to calibrate my antique oven. So I whipped it up again and after only twelve minutes of monitoring, success! Hubby said he liked this way better than the kind from the store. I don’t like cranberries or coconut and even I was munching on it! I’ve also made your apple muffins with Greek yogurt and healthy chocolate chip cookies, both fantastic :-). I’ll be poking around for more recipes to try! How long will this stay good for? It looks delicious!